There exist many styles and forms of animals, many ways of seeing them, of representing them and, even, of thinking about them and constructing them. Our animals can be symbolic, artistic, formal or realistic. And you, do you have a favourite animal? Are you ready to discover it? 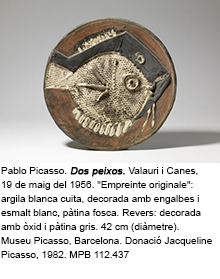 From the Museum of World Cultures and the Picasso museum of Barcelona, we invite you to delve into and explore the different forms of knowing and creating through animals. We encourage you to participate in our «Bestialities»!